In the low-lying and water-logged areas east of the Hondsrug large thicknesses of peat bog accumulated during the last few thousand years. 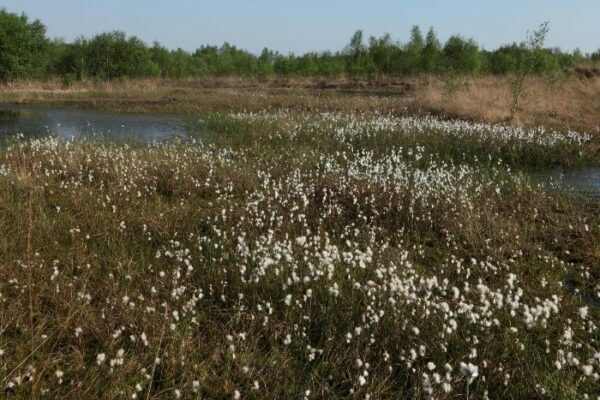 Starting from the Middle Ages, this peat bog became coveted because it could be excavated for ‘turf’, a much valued fuel for the growing population. So the digging of and trade in peat became an important economic activity in the area east of the Hondsrug. For centuries people toiled here, making a living extracting peat from the soggy soil on the far side of the Hunze river. While doing this they created a completely new landscape, the monotonous but fertile plains of the Veenkoloniën. During most of the Middle Ages the vast Bourtanger Moor on the east side of the river Hunze was desolate and inaccessible. The first large scale extraction of peat for fuel was started here by the rich monasteries of Groningen, mainly the rich and powerful abbey of Aduard. The Hunze river was the main artery by which the extracted peat was exported. The incorporation of the guild of Schuitenschuivers (Barge Masters) in 1403 consolidated the influence that the city of Groningen had in the Hunze area, giving the peat traders from Groningen a long-time monopoly in the peat trade on the Hunze river. The narrow, meandering Hunze river became increasingly unsuitable for the large scale peat trade. Therefore, the city of Groningen decided to dig a new canal: the Stadskanaal (“City Canal”). This canal was dug just outside Drenthe, giving Groningen full control over the peat export. In 1817 the nine main villages of the Hondsrug joined to sign an agreement with the city, regulating the transport of peat from Drenthe. This agreement covered a huge area of 14000 hectares and it resulted in the formation of new towns, laid out perpendicular on the Hondsrug, along the canals that debouched in the Stadskanaal: the ‘Monden’ (mouths) towns. The excavation of peat became an important industry, providing work for thousands of workers in eastern Drenthe. 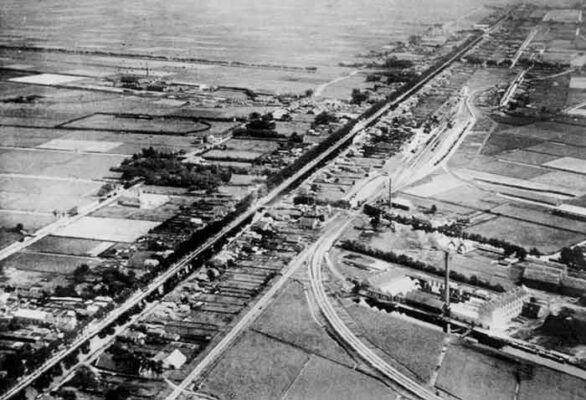 The new villages that were left after the peat extraction ended became the centers of new industrial and agricultural activity and they often grew larger in size and economy than the old villages on the Hondsrug they originated from. Production of peat reached its climax around 1870-1880; after that the mining of peat gradually declined and moved towards the Southeast. Eventually the peat production moved to the far south-east corner of Drenthe. Around Nieuw-Amsterdam the digging started in 1861 and finally, in 1914, in Schoonebeekerveen. The quality of the peat deteriorated towards the south-east; the peat becoming unsuitable for fuel. Instead, it was mined as garden soil. In this area the peat production was controlled by individual entrepreneurs, not the larger companies seen in the North. One of the most well-known entrepreneurs was Willem Albert Scholten, founder of Klazienaveen, an industrial town south of Emmen. 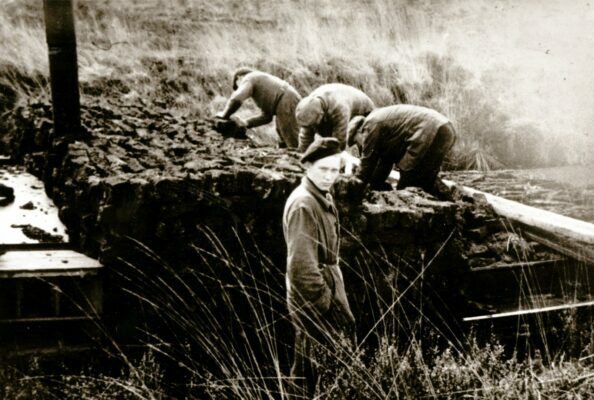 The exploitation of the moorlands attracted workers from many directions and backgrounds. The active diggers often came from Friesland and North Overijssel. They were attracted by the profitable work, but also by the relative personal freedom provided by the peat digging colonies. Many moved on with the progress of the diggings. Others stayed behind in the new towns and started a living in agriculture or other trades or new industries. 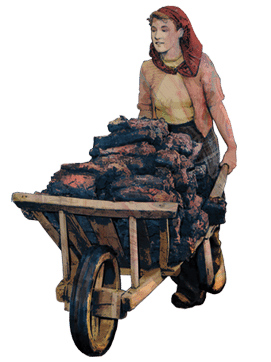 The professional peat diggers lived mostly in small brick houses, rented from the boss. 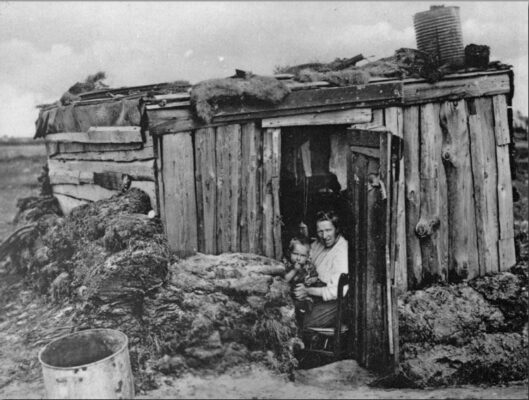 The large group of labourers without a steady contract tended to live in primitive hovels made of sods, partly dug into the ground, well into the 20th century.